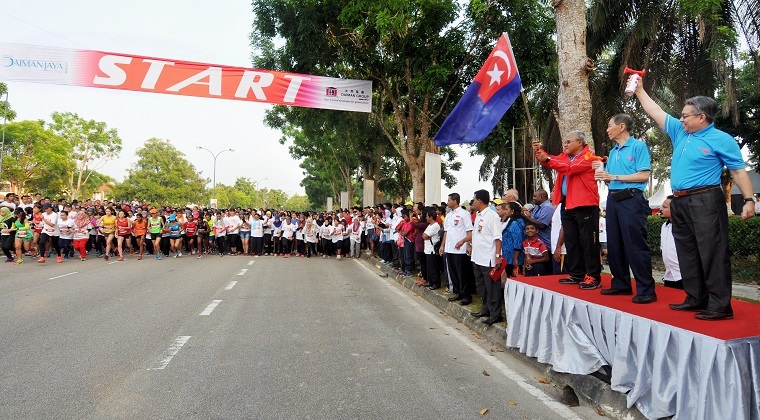 KOTA TINGGI: Close to 1,500 people from all walks of life thronged Kota Tinggi town here on 19.3.2016, Saturday for the inaugural Daiman Run@Kota Tinggi. The event which is aimed at dispelling negative perceptions about Kota Tinggi after the floods of 2006-7, also netted RM30,000 from registration fees which was donated to the Malaysian Red Crescent Society’s National Community for Community Services. Kota Tinggi district officer Tuan Haji Mohd Noorazam Bin Dato' Haji Osman who flagged off the event said this could be the prelude to more and exciting programmes here to draw people back to the town. “Kota Tinggi has undergone tremendous transformation over the past decade. Now is the time for people to put aside their fears of the floods and revisit the town to enjoy its many iconic tourist spots,” he said. Also present was Kota Tinggi District Council (MKDT) president Fizwan Dato’ Hj Mohd Rashidi, Daiman Group’s managing director Tay Thiam Song, executive director Tay Tian Liang, assistant director (project planning) Tay Hui Fong and general manager Heng Song Teck. The six-kilometre run within the Daiman Group’s Taman Daiman Jaya estate here, was split into three categories with the winners taking home a total of RM20,000 in cash prizes and medals. There was also a special quiz and lucky draw for Taman Daiman Jaya’s residents who participated in the run. The winners of the Open Category for male and female were Mohd. Jironi Riduan, 30 and Sharmila a/p Sivakumar, 20, respectively, who each collected cheques for RM2,000 with winners’ trophies, medals and certificates of participation. The prizes were given out by MDKT president Fizwan Dato’ Hj Mohd Rashidi. “The crowd turnout was better than expected. This inspired me to make it to the finish line,” said Mohd. Jironi, a former 2013 SEA Games gold medallist in the 800m and 1500m events in Myanmar. Jironi, a Sarawakian-born teacher at SMK Bandar Penawar, thanked the Daiman Group for organizing the run of this magnitude in Kota Tinggi. “I hope this will become an annual event. We need more such mass participation sporting events in Kota Tinggi,” he said. The run saw a carnival-like atmosphere with food and games stalls attracting scores of local residents and folks from around the Kota Tinggi district and Johor Bahru. Special momentos were also given to corporate sponsors and cash donors who had supported this event with their contributions. “We are very encouraged by the overwhelming response to the event. With the support of corporate sponsors and donors, the event is a success and has achieved all its objectives.” said Tay Thiam Song. Daiman Group is Johor’s home-grown property developer with a long-standing history of building quality homes and townships, many of which are now household brand names. Some 700 participants took part in the Daiman Chase the Light Relay at Taman Daiman Jaya here to promote healthy lifestyle and community bonding.